Kupperman's latest joins the realm of the deeply personal comics that seem to show up regularly in solicits, but - while there is no doubt this is a comic about Kupperman, never falls into what I could list out as the traps and pitfalls of the confessional comics that don't ever seem to have much of a point or hook beyond the author's misanthropic existence and easily avoidable @#$%-ups. Instead, the book weaves the stories of Kupperman's attempt to gather an oral history from his father, (who is slipping away due to dementia), his history with his father - a remote figure, and his father's opaque past as a nationally famous radio and television child star, featured in the program Quiz Kids, which ran from the early 1940's through the 1950's. But, really, the book explores the (frankly fascinating) history of the forces that put Joel Kupperman in front of microphones and later cameras for years - in order to understand the present, to understand how Michael Kupperman was shaped. The framing of Michael Kupperman in the relative present interrogates what could have been a straightforward retelling of the extraordinary life of the first few decades of Joel Kupperman - a child prodigy who specialized in solving complex mathematical equations in his head from the age most of us were figuring out basic elementary school math. This career as a child actually made him into a now-forgotten pop-culture icon of his day, but a household name. 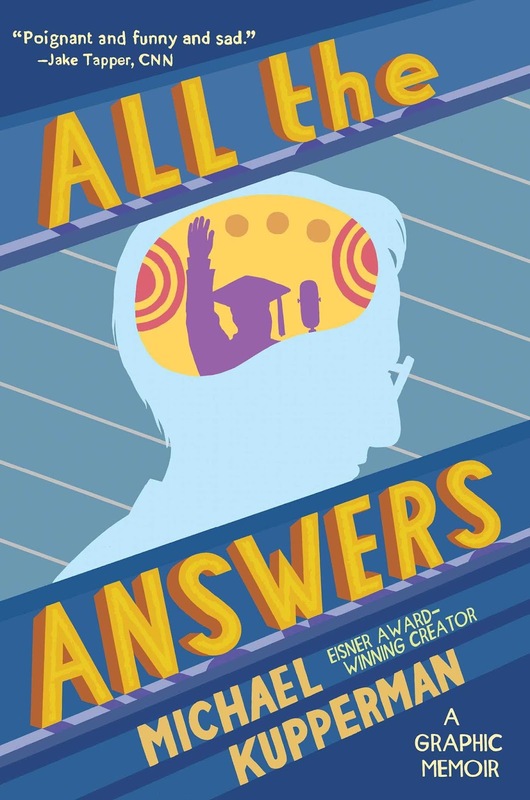 However, the senior Kupperman's career as a Quiz Kid was not something he ever discussed with Michael, just one of many things he seems to have withheld from his son, who knew his father as a successful, if remote, academic. Those familiar with Michael Kupperman's work know that a signature of his style is a terrific understanding of how to mix photorealism, occasionally detailed drawings and the very stylized/ cartoony, and he does no less here, to great effect. At times celebrities who drift in and out of frame are drawn from reference, as if Joel himself, in a frozen state, the same look in many frames, a kid drifting through, trying to stay afloat as all this happens. Kupperman draws himself as more of a broad cartoon - not stealing focus as her already has inserted himself into the story - but still needing to give the reader an in to not distance themselves from the author's POV. While the march of 20th Century personalities, all familiar to those of us of a certain age, is fascinating, as are the events surrounding Joel Kupperman's life, the blank spaces his son seeks to fill in and his 11th hour attempt to connect with the man as he slips away are all the more... difficult? heartbreaking? to read. It's odd that three extremely different graphic novels I consider some of the best I've read steep themselves in autobiographical wrangling with a past they can't control, of parents they never quite connected with, who remained elusive, and their children's need to understand. Maus, Fun Home and now All the Answers are histories less of the authors (we'll save that for Marajani Sartapi) and more of a chronicled history of the damage done by the circumstances that evolved before the author was ever born. But that's where the books end re: similarities. For a first book that I'm aware of that Kupperman has done that strays from his humor work, this is a terrific new direction. I mean, I still want more Twain and Einstein in my life, but as an artist and storyteller, it's a terrific evolution and I look forward to what comes next.